Last year I posted about a blueberry muffin recipe I made when I was visiting my sister in Oregon. It was really good, but I think I have found a better one. This one is really good. It is more cake like than muffin like. It is not necessarily a healthy muffin. This is more like a really good bakery style muffin. This recipe is adapted from a recipe I found in Martha Stewart Cupcake Cookbook. Yes, I bought another cookbook. I could not resist. I love to make cupcakes and muffins and knew I would love this book. It is similar in style to Martha’s Cookie Cookbook that I also love. Who couldn’t love cookbooks about cookies or cupcakes? Both are great desserts to make. So, since I had enjoyed the cookie on so much I went ahead and bought the cupcake book. And actually for a Martha Stewart cookbook both of these books are inexpensive. The original recipe for these muffins was called cupcakes because they had whipped cream spread on top of them like a frosting would be. I am sure that would be very good, but I like them as more of a muffin. My kids loved these for breakfast. Preheat oven to 350. Line 2 standard muffin tins with paper liners. Sift together flours, baking powder, and salt. Beat butter and granulated sugar with a mixer on medium speed until pale and fluffy, about 3 minutes. Beat in eggs, one at a time, and vanilla. Reduce speed to low, and add the flour mixture in 3 additions, alternating with the milk, beginning and ending with the flour mixture; beat until combined after each addition. Fold in blueberries by hand. Divide batter among cups. Bake, rotating halfway through, until golden brown, about 25 minutes. Let cool. yummy! I’ll have to try these. 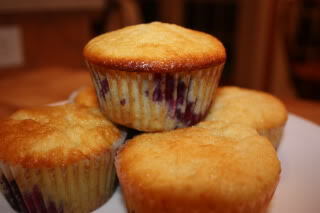 Great muffins, really yummy. I would like to have many like that. I looked and didn’t find cake flour at the tiny little grocery store available here. Could I substitute all purpose or bread flour or should I wait until I can get my hands on some cake flour? Thanks for all the great recipes, by the way! Marybeth, cake flour is going to give you a little better texture. It is made from a softer wheat. You can however use all purpose flour. But you use 1 cup minus 2 tablespoons of all purpose and make sure to sift the all purpose flour. I have done this in other recipes, not this one. I hope that helps.